White-eyed Gull L. leucophthalmus adult with adult winter Sooty Gull (L. hemprichii), March 04 2002, visitor's centre of Nabq National Park, SE Sinai, Egypt. 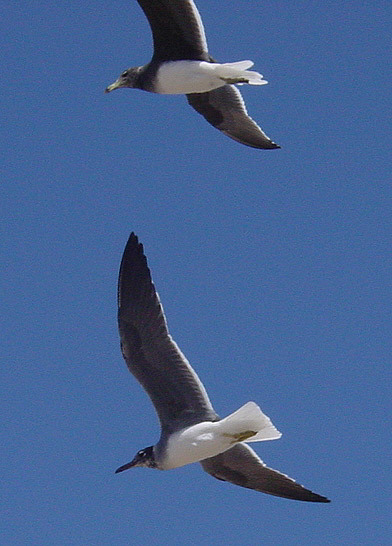 Compare the flight silhouette of the adult White-eyed Gull with the adult Sooty Gull (top). Note the characteristic droopy, long and thin bill. In White-eyed Gull the wings are pointed and less broad than in Sooty Gull. Note the broad white trailing edge in the Sooty Gull. Sooty Gull has rounded and broader wings compared to White-eyed Gull, and a more swinging flight-impression, unlike the stiff flight of White-eyed Gull. In flight the stronger neck and breast are obvious in Sooty, creating a profile more in line with white-headed gulls from the Western Palearctic. White-eyed Gull resembles smaller gulls in this respect, accentuated by the long, pointed and less broad wings. Note the obvious white trailing edge which is much thinner in White-eyed Gull. The tail is completely white lacking the black immature markings which can be found in second winter birds. The hood in adult winter plumage is only slightly peppered on the lower part at the throat. The black primaries have white tips from p5 or p6 inwards, but these tips may be worn away by February. In Sooty Gulls the inner eight primaries show white tips. Note the difference in moult stage of the rectrices.